Tottenham Hotspur 0-3 Liverpool | Two young managers, similar systems, exciting football, insistence on ground play, hard pressing, and quick pace. Both these sides and the men in charge had similarities, which even extended to their ambitions for the season. The game was meant to be close on paper, and turned out as planned for large parts of the opening 45, but the gulf in class showed as the game wore on with Liverpool emerging the better side. Coming into the game it was clear that these two sides could very well play out an exciting 90 minutes. Both Mauricio Pochettino and Brendan Rodgers believe in a system of regular pressing, recovering possession and quickly turning that possession into a goal-scoring opportunity. The Spurs boss has displayed during his time at Southampton and in the opening games of his time in London; Liverpool’s Rodgers instilled a similar identity to his side last season, one which seems to be ever improving. But there was striking difference in the two pressing systems deployed by the managers, and this difference also shows the tactical flexibility of each side. The home side’s pressing game was a rather restricted one, and not as high & advanced as we’ve come to see in modern football. Emannuel Adebayor being the furthest forward did put pressure on the Liverpool centre-backs & goalkeeper, but he was the only one to regularly do so in the opposition half. The rest of the team were instructed to keep their pressing limited to their own half, rarely extending beyond the half-way line. This restricted pressing from Spurs is evident in the image above, Adebayor (though he was excellent in closing down the defenders) isn’t really looking to win the ball back as much he is looking to prevent time on the ball for the Liverpool players in deep positions. His pressing was more to speed the game up, rather than regain possession. The rest of the Spurs side are content sitting back as long as the ball remains in Liverpool’s half between their two central defenders, Sakho-Lovren, and the deepest midfielder in Steven Gerrard. Again here we see how Spurs close down the Liverpool players when they get possession in their half, but rarely exert any pressure when the ball is in Liverpool’s half. Again, Sakho, Lovren & Gerrard are fairly free when they have the ball but Sterling instantly has two men on him as he receives a pass. This of course did make it difficult for Liverpool to play passes in the opposition half; Pochettino set out with a plan to restrict possession and passes in that attacking midfield area of Liverpool’s. A clever ploy. but Rodgers had more up his sleeve (more on that in a bit). Liverpool’s pressing was strikingly more advanced and higher, with an intention of regaining possession as close to Spurs’ goal as possible (or in fact wherever possible). It was typical high intensity stuff from Liverpool and they weren’t willing to allow Spurs to have possession in deep areas (probably because if forced into long balls, Adebayor would be an ideal target and would thus be difficult to deal with). This high pressing prevented Spurs from playing their usual quick passing, high intensity game from the back. As seen above, the Liverpool side are penning Spurs’ defence as far back as possible in the hopes of regaining possession of the ball and preventing creation of an attack with direct passes from the back, like their Argentine coach likes to. Allen & Sterling press Eric Dier and his closest passing option (here Kaboul) respectively, with Balotelli, Sturridge on hand for other potential passing options. Notice Henderson too in a deeper area but in Spurs’ half to further add numbers to the press. Even when a midfielder drops into deep territory to collect possession, Liverpool players are in proximity to quickly close down the man on the ball; no time, no space when in possession. The more advanced players are quicker to close down the man on the ball, while the deepest player in the image, Steven Gerrard, just sits there should he wriggle his way through. Should be stated here that the above actually created Spurs’ only proper chance of the first half with a ball over the top to Adebayor (though the chance creation wasn’t really in Pochettino fashion, so the system achieved it’s objective). Here again is another example of Liverpool’s high intensity pressing, five players in the Tottenham half with three quickly closing down even a slight whiff of time on the ball for the man in possession and his immediate passing option. Danny Rose in the bottom is the easiest option to play it to, but even Liverpool would allow that much of freedom. Notice how high Liverpool’s defensive line is again; this being an attempt to keep things as much as possible in the opposition half. It would be this pressing that also created the first goal. Now the idea from Pochettino was right, or would have been, had Liverpool gone with their system of one man up-top and three attacking midfielders/wingers fluidly behind him. It seems as though Spurs expected that, with probably Sterling, Coutinho & Markovic behind Sturridge. All the creativity, possession & attack would have primarily come through those three and shutting them down would have been the key. But such is the depth & tactical flexibility of Rodgers’ side, that controlling that attacking midfield area wasn’t really an objective with only Sterling playing in there. Liverpool’s main threat came from elsewhere. Now while the difference in pressing actually had the greatest impact in the way the game flowed, the most direct impact on the scoreline was the Liverpool shape that allowed runs from their wider midfielders in Jordan Henderson & Joe Allen. Gerrard’s defensive issues, which were evident against Man City, prompted Rodgers to make changes that ensure some sort of solution was obtained. With the side lacking a pure defensive midfielder (except Lucas who has questionable form), Henderson & Allen were played on either side of Gerrard with their work-rate crucial in providing that cover. In addition to that, Balotelli & Sturridge were often drifting into wider positions (the former left and latter right) thus attracting the attentions of both the Spurs defence and midfield. This opened up spaces for Sterling, Henderson & Allen to run into. As seen for the first goal, Sturridge got into a wide right position to collect the ball after Henderson won it back on the half-way line. The attention of the four-five Spurs players’ immediately around Sturridge fall onto the English striker as he proceeds with the ball, none really getting tight to him. All the Spurs players are focused on the man on the ball, allowing Henderson to make an almost free run in behind the defence. Kaboul plays him onside with the Spurs captain half focusing his attentions on Raheem Sterling who, as well, otherwise has another unmarked run. Henderson’s run in behind the defence and Sterling’s at the far post was clever, but as simple as it could have gotten for Liverpool to open the scoring. Liverpool’s second goal too came as a result of this run from midfield with Joe Allen the focus. Though his run wasn’t directly effective, his presence in the box certainly had a bearing. He too did make an unmarked run from deeper in midfield with no one getting tight on him, until he passed and moved into the box, before which his turn after receiving from Sturridge drew the foul. Now while I mentioned how Pochettino came in with the intention of containing a potential three man system behind the striker, Rodgers too came with this intention. 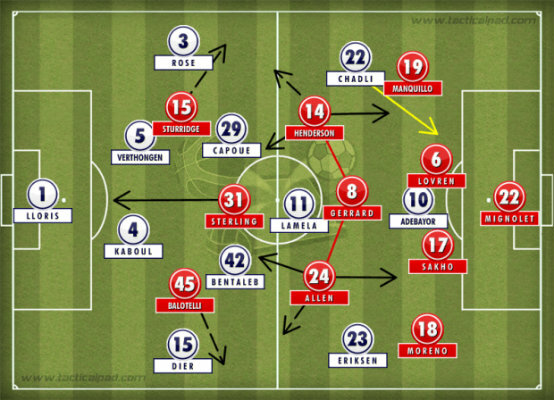 But while Rodgers’ tactical flexibility changed that system, Pochettino played right into Rodgers’ hands. Those three have been stand-out performers in the early games for Spurs, connecting fluidly and capturing the imagination of the Spurs supporters. But against Liverpool, it was shown how easily they can be kept under control with their impact reduced and influence nullified. Above is an example of how in a defensive phase, Liverpool’s midfield stuck close to those three, reducing their threat by preventing possession of the ball in key areas, and any time on it either. Chadli here of course is in a more advanced position, but he too was fairly under control. Liverpool were more content with Spurs having possession in the wide advanced areas but made it extremely difficult for them in central areas, tightening the zone. This tactic proved to be most effective in Liverpool seeing the game out as well. The Liverpool defence were by no means solid with some shaky moments but they kept a clean sheet by containing that key area. Once they were 3-0 up, their attacks were greatly reduced, restricted to quick counters, instead focusing on maintaining that clean sheet and advantage. It was a sign of a maturing Liverpool side, implementing a professional strategy of containing opposition once the result is in the bag rather than providing more exciting football and looking for goals. The image above is evidence of this display with nine players back defending, reducing any space in between the lines and giving no chance of penetration. Daniel Sturridge is the only man in the opposition’s half. The Liverpool of last season would have likely gone for more, probably got another but at the same time left itself vulnerable to concede at the back. But it’s important for a side with ambitions as high as theirs and Champions League football, to have the ability to see results out. To draw conclusions so early in the season would be extremely foolhardy and yet the game showed us that Liverpool are a team well versed in the philosophy of the manager and although the loss of Luis Suarez is a big one, they’re still a force to be reckoned with. It was their first really convincing performance of the season and they head into the International break on a high. For Spurs meanwhile, it was a bit of a reality check after a great start to the campaign. Pochettino will be the first to admit that while they’ve started brightly, Liverpool was Spurs’ first big test and it showed that there’s still plenty of room for improvement. Early days in Spurs’ new era though, so don’t write them off yet.